To provide a wide and innovative choice of products and services that will enhance our client's style and creativity. To provide a positive work atmosphere, which will encourage and challenge our staff to continually improve of themselves, the products we produce, and the services we provide. 1949 - Jack and Virginia Miller began the party rental business as the AAA Chair and Table Rental in February. Later, AAA was also incorporated under the Akron Chair and Table Co., using both names interchangeably until the late 50’s. Miller’s started in a two car type garage with maybe 60sq feet of storage space behind Virginia’s mother’s house on 18th St. in the Kenmore area of Akron. In July of 1949 our competitor The Acme Rental Co., reported to the authorities that Miller’s was operating a commercial business in a residential area. We were then forced to move the inventory to other garages on Florida Ave. in Kenmore. The office still operated from the 18th St. house. 1951 - After two years in business we grew and expanded into storage garages in an alley between 12th and 13th streets one block north of Kenmore Blvd. 1955 - Jack Miller , along with other rental company owners nationwide, started the National Rental Assoc. (NRA) in Columbus, Ohio. Through this business association we became aware of the many products and services available, and started adding and growing the product lines available to our growing cliental. 1960 - Acquired the assets of the United Party Rental Co. in Tallmadge which was a tool and party rental company that wanted to specialize in contracting equipment. 1963 - Opened our first retail store with display area and offices at 998 Kenmore Blvd. With this move we changed the then corporate name to: Miller’s Rental & Sales Inc.
Jack Miller up to this time had been working a full time second job for the railroad at night and the company during the day. He then retired from the railroad giving his entire attention to the company. 1968 - Acquired party rental division of the O’Neil’s Department Store. 1975 - Our next growth happened with the moving of the Akron store from Kenmore Blvd. to the location at 284 Market St. in Akron. 1978 - The current owner of the party division, Charlie Miller (and his wife Jill) join his older brothers and starts his role in the management of the company. 1979 - Acquired Acme Party Rental Co. which was a division of Akron Home Medical. 1990 - Separated the medical and party divisions in Akron by moving the party division to their own location with 10,000 sq. feet at 1450 Firestone Pkwy. This freed up the entire East Market St. location for medical and rehab services. 2000 - Split the Party and Medical divisions into two separate corporations. Medical kept the name of Miller’s Rental and Sales and Party took on the current name of Miller’s Party Rental Center (or MPRC for short). 2003 - Acquired the assets to Big Top Party Rental in Alliance. 2005 - Miller’s moves to its current location at 869 West Waterloo Rd, in Akron. This took our location from a 10,000 sq. foot office/main warehouse and 15,000 sq. foot satellite warehouse, to an almost 30,000 sq. foot facility to house all operations under one roof. Dean Miller joins Charlie in the day to day operations of the company. 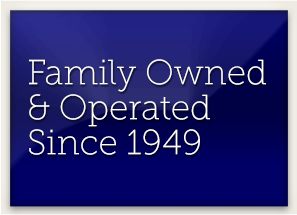 Establishing Miller’s as a third generation family owned and operated business. 2009 - Miller’s celebrates 60 years in the event rental industry!